The University of Wisconsin–Stout Blue Devil women’s softball has been a powerhouse so far this season, and their sweep over University of Wisconsin–Eau Claire, Northwestern and University of Wisconsin–Superior on April 9, 10 and 13 is a prime example. The Blue Devils defeated UW–Eau Claire 8-6 and 8-4, Northwestern 13-2 and 12-1 and UW–Superior 6-0 and 5-4. The UW–Stout softball team has been pulling together exceptionally well this season. Their great performance on the field proves that working together as a team and utilizing every athlete for their respective talents is a successful strategy. A few players were asked to comment on players that have stood out this season so far, and Workman named quite a few outstanding players. Senior catcher Sam Hastings of Waukesha, Wis. has been great behind the plate and at the plate, committing just one error in 178 chances while batting .371 with three home runs. Taylor Workman, a junior from Prior Lake, Minn., has been one of the top batters for the Blue Devils, batting .333 with a pair of home runs and 17 RBI for the season. 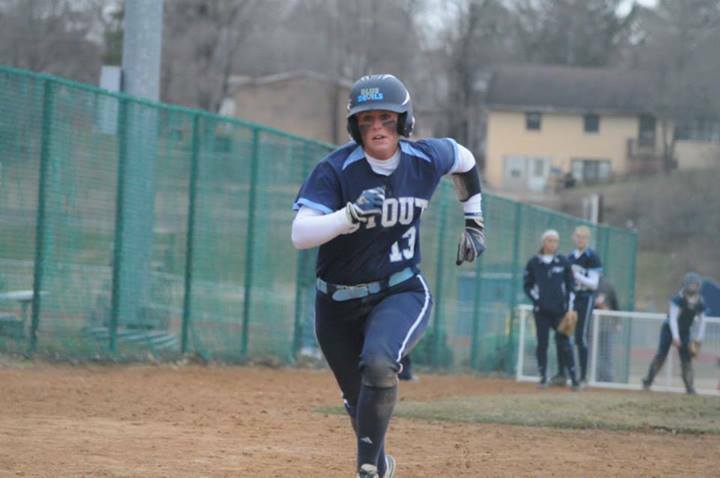 Hannah Sweet, a senior from Elk River, Minn., had a two-run homerun in the UW–Eau Claire game, which put UW–Stout in the lead. Lynzi Knudtson, a junior from Melrose, Wis., has been a strong contributor, playing great defense at shortstop while batting .386 this year. Kate Stark, sophomore from Hastings, Minn., is tied for the team lead with three home runs. Nicole Rogers, a sophomore from Brooklyn Center, Minn., has been a steady presence in the field and at the dish. Courtney Smith has made a number of great catches in the outfield. Knudtson spoke very highly of pitcher Tori Workman, who has been named WIAC pitcher of the week three times this season. She said Workman has been working so hard for the team in the pitching circle. Workman has an impressive 130 strikeouts so far, most in the conference. The team hopes to continue their strong play down the stretch as the Blue Devils take on University of Wisconsin–River Falls in a home doubleheader on Wednesday, April 23.